The star of the ITV soap Coronation Street Bhavna Limbachia has praised the NHS after she was rushed to hospital while suffering with gastroenteritis. The actress, who plays the love torn Rana Nazir in the long running soap opera, was taken ill with the condition – with the symptoms of which ranging from vomiting to fevers and dehydration – and was rushed to hospital. Gastroenteritis is known to be a condition brought on by inflammation of the gastrointestinal tract that effects the stomach and small intestines. Since her scare however, she has thanked the NHS and updated her fans, reassuring them that she is on the mend. Bhavna took the time on her Instagram story to thank the doctors and nurses who attended to her when she was admitted into hospital. She has also shown appreciation to her fans and well wishers for their messages of support and kindness. Apart from updating her followers, she is currently taking a break from social media as she recovers from gastroenteritis, which if not closely monitored, can really do some damage to a person’s health. According to reports, she was also suffering from a build up of acid in the gut. Bhavna’s character, the nurse Rana, is in the middle of one of the most dramatic storylines in recent Coronation Street history – as she has left her husband and her stable life behind after falling in love with her best friend Kate Conner. Though Rana has already been through the emotional ringer, it looks to get even more desperate for her. Not only has her marriage with Zeedan completely broken down, but now her disapproving parents have struck a deal with her husband to save the social embarrassment and keep the pretence of the marriage going in exchange for the start up money for Zeedan’s business. 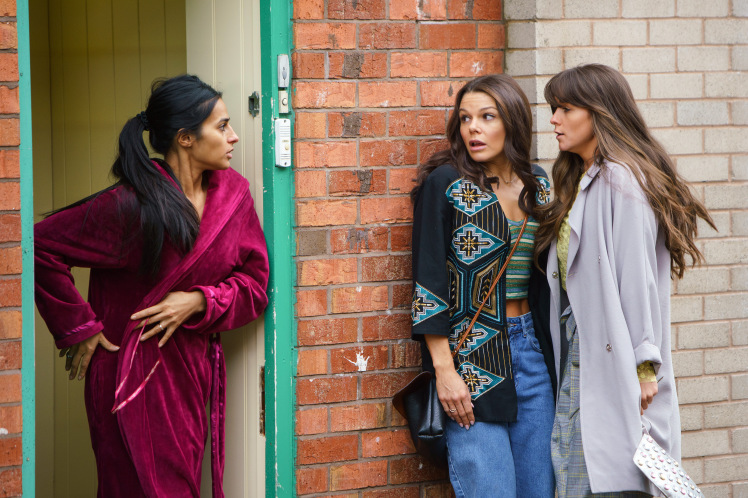 But as if that wasn’t bad enough, with Rana and Kate set to reunite in the upcoming episodes of the show, the plan to keep the secret behind closed doors will intensify as Rana’s parents look to ship her off abroad. Luckily for Rana, brother Imran and Kate will save the day. According to reports, Kate and Imran will reportedly come to rescue of Rana when her parents kidnap her and attempt to send her abroad in an effort to keep her apart from lover Kate. It seems to have gone far beyond the breakup of a marriage. Instead, Rana’s parents are terrified of being left shamed by their daughter’s sexuality, as Rana’s feelings for Kate grow and intensify. The story of Rana’s kidnapping by her own parents was first leaked by Metro, with a source saying: “The course of true love never did run smooth and Rana’s parents would do anything to keep her away from Kate – even if that means taking her away from Weatherfield for good. What will happen? Will Kate and Rana finally be reunited and be able to live happily ever after? What will happen with Rana’s parents and what will be the aftermath of the marriage and the future of Zeedan’s business? Is that Jason Manford in Corrie? Well, we’ll have to wait and see what happens with that one. Another thing, however, that has gotten Coronation Street fans obsessed is the sight of Jason Manford’s doppelganger on February 28th’s episode of the show. And seriously, it’s like they’re twins. Viewers could not help but notice how similar an actor playing a policeman that interviewed Bethany Platt and the comedian Jason Manford looked! As the policeman appeared in the interview room with Bethany and mum Sarah, fans practically swarmed Twitter and inundated Jason Manford with questions regarding his supposed doppelganger. The policeman was interviewing Bethany after she glassed a punter in Tassels nightclub. The troubled teenager, who has been through a lot in recent months, suffered a horrifying flashback and believed that the man in the strip joint was the evil Nathan Curtis. Fans were shocked as she grabbed a glass bottle and smashed it before hitting the man with it. Having already been reduced to tears, Bethany tried to explain what drove her to injuring the man, as she told her mum Sarah and the officer what happened.